Snow on rooftops, smoke from chimneys– winter is here. 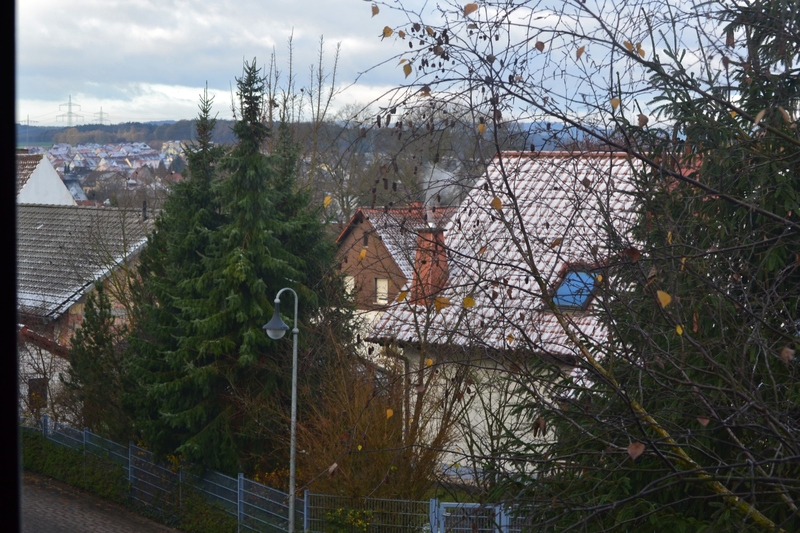 We woke this morning to a dusting of snow and ice in the Rhineland-Pfalz. The cold had swept in yesterday, and we were beginning to feel the holiday spirit. 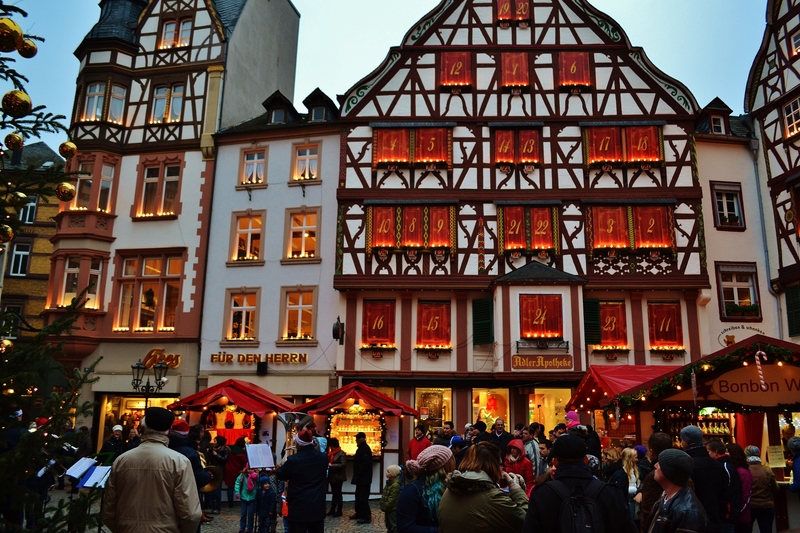 Late yesterday afternoon, we zipped over to Bernkastel-Kues, on the Mosel River, to catch the opening salvo of their Christmas Market. We drove from cold and drizzle, through a snowy pass, and down into the town of Bernkastel, which seemed to be gripped in an arctic cold. 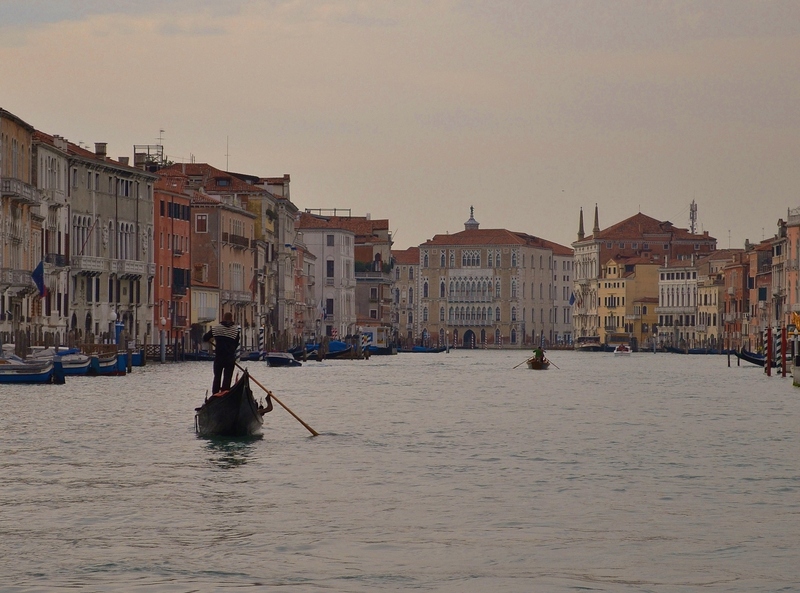 The market opened just that day (and will continue through December) and it was much less crowded than when we visited last year– which left us able to enjoy the beauty of the town without having to dodge the crowds. All sorts of food and gluhwein were on offer– and we sipped the hot wine, but not too quickly (it was a great hand warmer!). At one point, we had to clear a narrow lane to let St. Nikolaus and his horse-drawn carriage and entourage of mariners and fire fighters pass. We had read that St. Nick was the patron saint of mariners. 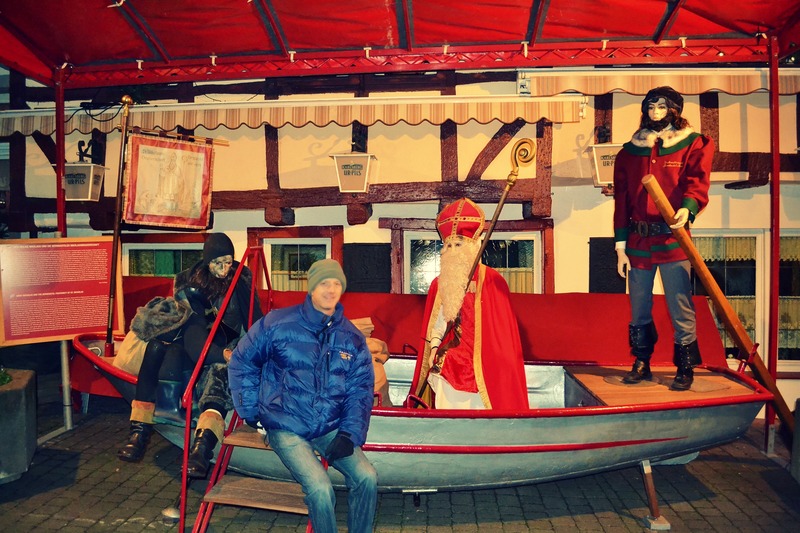 In fact, I read that last year after visiting Bernkastel’s Christmas market and seeing Nikolaus and his sidekick Knecht Ruprecht in a boat. Here’s a photo of last year’s boat display with St. Nick and his ominous sidekick (the mannequin to the left, in the black cape and boots). 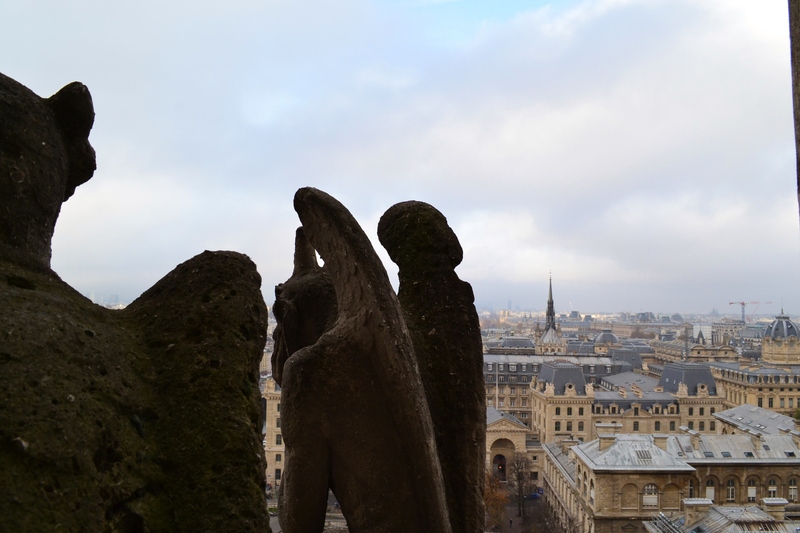 St. Niklaus and Knecht Ruprecht–sit between them. Were you naughty or nice this year? It’s too bad that I didn’t have my camera with me yesterday because Knecht Ruprecht was even more ominous this year. This year, that sack he’s carrying wasn’t just stuffed with something out of sight (coal and switches was my assumption). This year, someone’s been really naughty–there was a child’s leg and boot sticking out of the sack. Yikes! These draconian sidekicks of St. Nikolaus (Knecht Ruprecht, Krampus, or Schwarz Peter, depending on what region you live in*) often whip naughty children or give them coal and switches instead of candy. But occasionally the children have been so bad that they are abducted (dragged to hell?) or carried off to be thrown into the cold river. This could make a good child of the worst of us, because the Mosel River is VERY cold right now–polar bears aside, no one wants a dip in that. I am breathing a sigh of relief today, because Nikolaus gave me a friendly wave as his carriage passed last night. Pretty sure I’m on the good list this year. Being American, my family begins our Thanksgiving week today, so the holidays are now in full swing for us–how nice to have that echoed by the weather and the Christmas markets here. My oven was cranked up to full tilt today, the house smelled great, and the holiday candle arches were set up in the windows. We’re getting ready! Now, if we could just conjure up a little Peace on Earth . . . 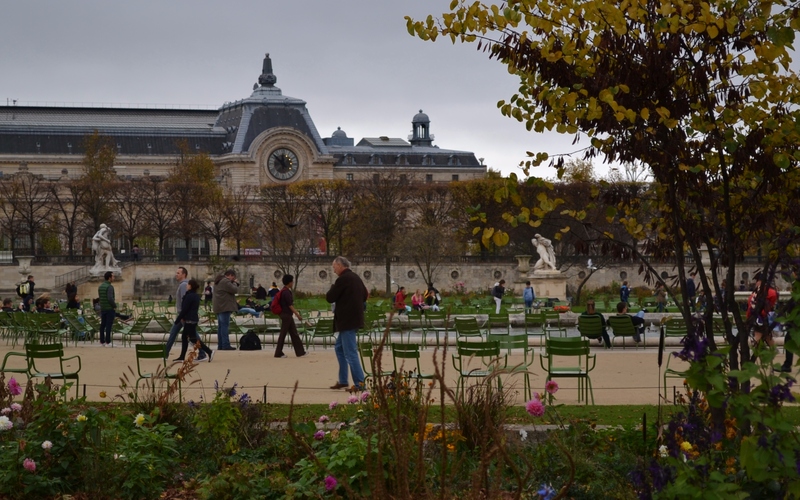 The first thing we did after arriving in Paris last weekend and dropping our bags at the hotel was to stroll down to les Tuileries gardens, just a block or two away. We had been here back in June and loved the festive summer vibe of the space: children were running, jumping, sailing their boats in the ponds; adults were lazily watching and talking. The sky was a fantastic azure blue; the air was sweet with the scent of flowers in bloom. 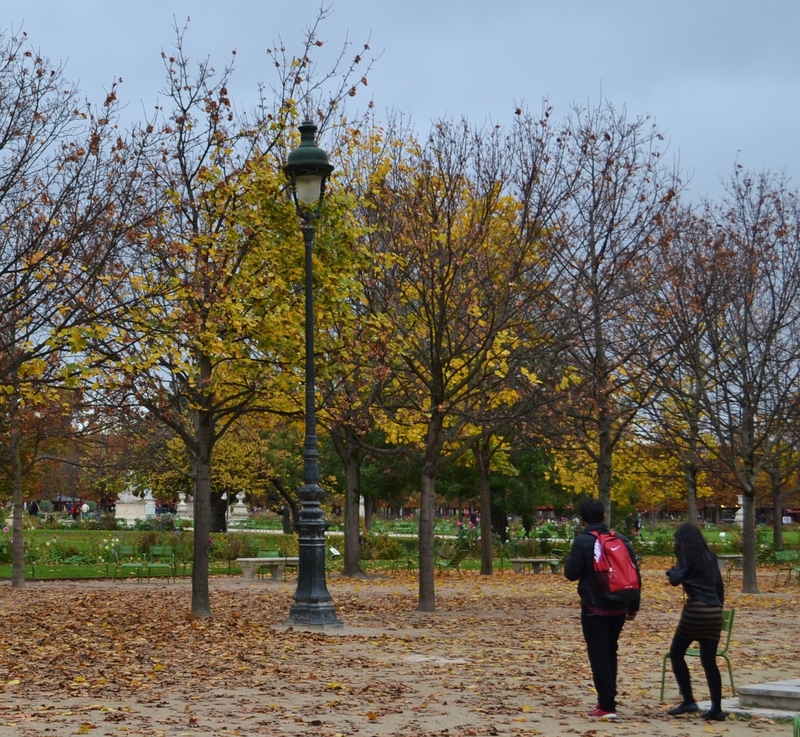 November in les Tuileries has its own vibe– more subdued, but no less wonderful. 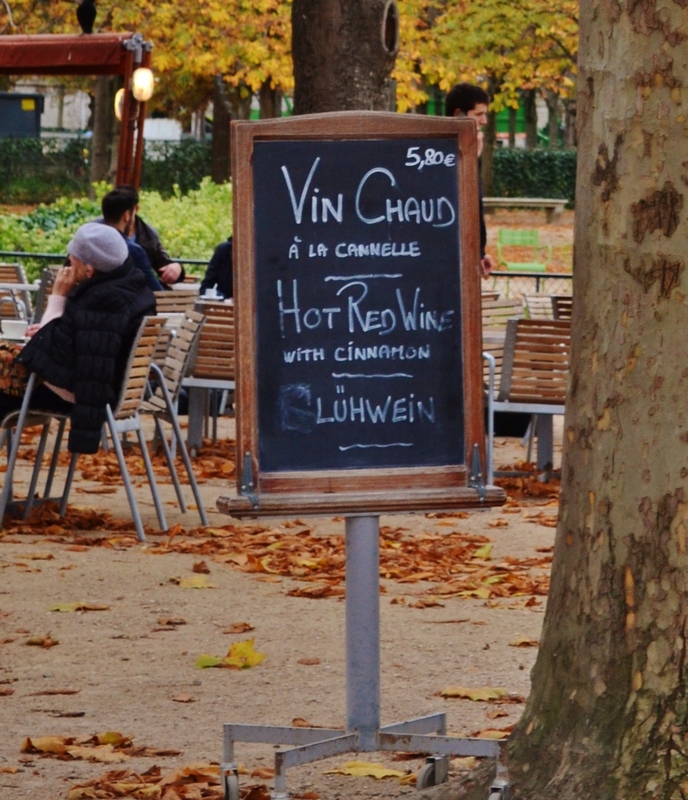 For the most part, chairs were empty and people strolled rather than sat; leaves fell and the breeze blew lackadaisically; cafes offered up vin chaud (mulled wine); and all was right with the world. Viva les four seasons! 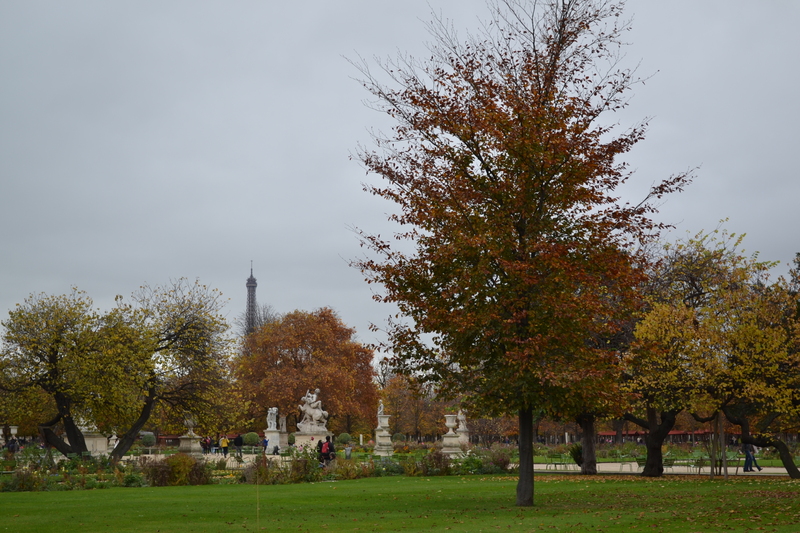 Viva les Tuileries!